What are you afraid of? It’s time to let go! I’ve cleared a lot of unused items from my home over the years since becoming a minimalist. Many I’ve donated, and many I’ve given to friends. 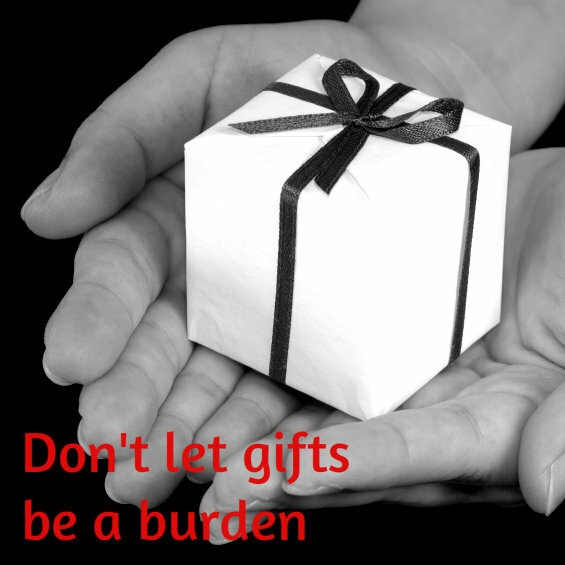 Gifts are not supposed to become burdens. When we receive things from people that love us, they’re not intended to weigh us down. Our loved ones give us stuff to help us out. To be kind. Because they think we might like it or it might be useful to us. So don’t ever feel obliged to keep anything you’re given. I know a lot of people feel they must keep gifts. That’s not so. You have no responsibility to keep any items you’re given. Not ever. If you don’t need or want something, no matter who gave it to you or how valuable it might be, let it go. Donate it, give it to someone else, or sell it. Don’t let it weigh you down a moment longer. Because nobody ever wanted that. I just wrote about gifts as well, only more on the giving gifts side. I agree with you, we are certainly not obligated to keep any gifts we are given. It’s such a challenge sometimes though. I’m actually currently struggling with parting with a gift which was handmade from a family member. It really is hard to let go sometimes, I agree with you. But what surprised me was how much guilt I had associated with keeping handmade gifts, when the person who had given them to me had long since forgotten about them and moved on to their next project!